It was a night to be remembered—for another 90 years! Becky shared the stage with a number of luminaries, including Congressman Denny Heck and here, Deputy Mayor Jason Whalen. 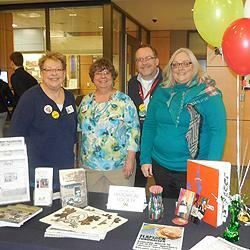 …is the LHS table, manned here by current President Sue Scott, Becky, Board Member Rich Wall and Secretary Sharon Taylor. January 23rd 2018: Harrison Prep, Lakewood's newest public school, is the fitting locale for a celebration of both old and new—new hosting the 90th for the old 400. Clover Park School District #400, that is—the biggest birthday bash Pierce County has seen in many a year! Dignitaries from the political, educational and military spheres were present on the Harrison auditorium stage—among them our own Becky Huber, Past President of the Lakewood Historical Society, who filled the audience in on the history behind the celebration. Her remarks brought to life the heroic struggles and never-say-die spirit of a few public-spirited citizens and educators who, way back in 1928, had the foresight to realize the future of education in what was then a sparsely-populated patch of lakes and prairies would require somehow forging five fiercely independent grade school districts into a larger, more effective whole. In 1941, when the last bricks had been laid for Lakewood's very first high school, Iva sprang her new name on officials of the district and the general public. 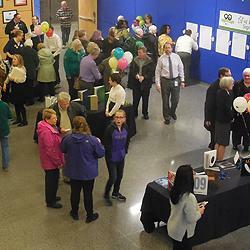 It was a name with a past—one the pioneers had first used to describe the Lakes District's lush, sprawling green fields—but also one that looked forward, acknowledging the new day that had dawned with the opening of a school that was not just new, it was the first of its kind in south Pierce County. Iva's suggestion was, of course, adopted—and thus was born the Clover Park School District we know and celebrate today. For more on the history of CPSD, see our Winter 2018 newsletter. 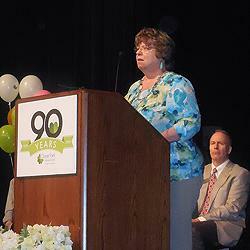 For additional coverage of the celebration, see the article in the Northwest Guardian.